I see it more like Shepard Road east of I-35E only becomes a new state highway, and MN 5 just ends at the bridge. This would move further towards the eventual goal of having the trunk highway system correlate with principal arterials and turnback money becomes available to help rebuild 7th to accommodate trains. Sometimes I'll use it on my way to Ax-Man and Midway Books just to be different, but I could easily stay on the freeways if it's rebuilt for rail. The problem with routing 5 (or any state highway route) along Shepard is the lack of access to from 35E North. This is a big reason why West 7th between the bridge and 35E carries around 30K ADT...the full access at 35E. Adding such access at Shepard would be extremely difficult due to the river bluff and how 35E climbs the bluff there. Regarding the thought of reconstructing West 7th to include LRT, I came up with this cross-section to conceptualize it. Existing West 7th has 54ft of street width (curb to curb), and 80ft of right-of-way width (sidewalk edge to sidewalk edge). While this is enough width to reconstruct the street to include LRT, there's not enough curb width, especially at transit stations and intersections requiring left turn lanes, to do so without impacting the boulevard. What I came up with in the Streetmix link would require some cutting into the boulevard, but would still leave a partial boulevard intact on a typical block. Unfortunately, the ROW on West 7th is narrow enough to where not everyone will get what they want, nor would it be the most desirable in some areas. For cars, there is no way to run more than one lane in each direction with LRT in the street. This shouldn't be a problem between downtown and 35E, where volumes are at or below 17K...within the capacity range of a 2-lane street with adequate turn lanes. But it's a huge problem west of 35E, where traffic jumps to around 30K as I mentioned above. For bikes, there's no way to run bike lanes without eliminating the boulevard at intersections and LRT stations. On-street parking would only be possible mid-block on one side of the street, and that's only if you skip bike lanes. Sidewalks wider than 7ft would only be possible by taking out the boulevard. The advantage of running along West 7th is that the line would be closer to places people would actually go and come from along the corridor. The main disadvantage, described above, is that the limited street width limits what sort of amenities could be included. Elway Street one block west of I-35E could be a connecting road from Shepard to allow northbound access to the highway from Montreal, or possibly some new more direct routing. It's four lanes, but currently only sees 4,600 AADT. That's a possibility, though you'd still require some right-of-way to tie it into 35E north, plus the grade on Elway is 5% so it'd be a little tough for larger vehicles. I still think the CP Spur is a better routing than Fort Rd for the stretch west of 35E. It's also fairly easy to use the median on Edgcombe Rd and a deck over Fort Rd to get the line across the river. Extreme care would have to be taken on the Fort Snelling grounds, but I think this is doable. Looks very familiar...... I like it. Like the routing there on the Fort Snelling side. Don't see a need for the second Snelling station, though. I think Highland Park/Sibley Plaza could do with two stations, one just across the bridge serving the apartments/industrial area on Shepard road, and one just past Sibley Plaza. And draw this with Hwy 5 interlined with Shepard, leaving the LRT on West 7th, and people would love it more. The eastern station is probably for the Fort and the State Park. Both are a pretty long walk from the existing station. froggie wrote: For cars, there is no way to run more than one lane in each direction with LRT in the street. This shouldn't be a problem between downtown and 35E, where volumes are at or below 17K...within the capacity range of a 2-lane street with adequate turn lanes. Pardon a tangent, you mention 17K is enough for 2-lanes plus adequate turn lanes. Is there a source I could point to to back this up? I ask because the Blake Corridor project in Hopkins is 14K now and projected to go to 17K and that is being pointed to as justification to keep it 4-lane plus turn lanes. It feels wrong but I want to go at it with data. I like this plan. 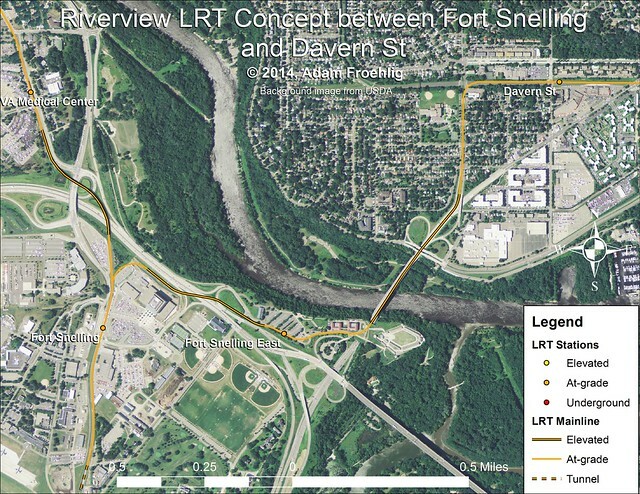 I am thinking the route through Fort Snelling would be opposed. Also the MOA station would have to add two new bay for trains. 10K is normally what justifies four lanes, but there are other factors at work in urban areas; a lot of times there isn't room for turn lanes, for volumes over 10K to around 20K a three lane road with turn lanes can function as well as a four lane road without, although not as well as a four lane road with turn lanes. I think the consensus has put the capacity of three-lane streets (center turn lane) at around 15-18k AADT at this point. Several factors at play. Rural/suburban/urban is one factor. Number of intersections or access points is another. Frequency of traffic signals can also play a factor. At a planning level, 10K is commonly used in rural areas, while 15K is a general number for typical urban streets. I mentioned it might be okay along West 7th up to 17K because, with LRT in the median, left turns and driveway turns will be significantly limited, which would increase the overall vehicle capacity of the street. Since it got mentioned earlier, the "Fort Snelling East" station is for the historic fort...much closer than the existing GSA/Fort Snelling station. I also envisioned that as an additional park-and-ride station, since I HIGHLY DOUBT those parking lots are used to their full capacity. I wonder. Since there will now be 2 LRT lines going in and out of the Mall of America, would that be enough to push for a facilities upgrade at the MOA station? Maybe a little bit cleaner and more "modern"? Edit: I guess there's a phase II already ongoing according to this http://www.lsadesigninc.com/#!mall-of-a ... ter-p/cq5o, can anyone confirm? grant1simons2 wrote: I wonder. Since there will now be 2 LRT lines going in and out of the Mall of America, would that be enough to push for a facilities upgrade at the MOA station? Maybe a little bit cleaner and more "modern"? It is in the plans, but last I was thru there it had not started yet. We can only hope that they start it this winter as it would be easy for it to be done away from the elements. They were looking for TIGER funds, but weren't allotted any this round. Not sure what, if any, next steps are. Ramsey County ordered Metro Transit to put the B-Line aBRT project on hold indefinitely, until they get through an alternatives analysis for Riverview. Does anyone think for a second they will ask the same of MNDOT and the planned Hwy. 5 bridge rehab? Would MNDOT in a million years allow the inner lanes of this bridge to be taken from cars and given over to LRT? Could the existing bridge, even with a spendy rehab, support LRT? Consensus seems to be that creating a new river crossing into the Fort Snelling area will be difficult to impossible. If Riverview is going to happen, it's going to happen on the current bridge alignment. Something tells me that as bad as some Ramsey/St. Paul leaders want rail, there's going to be a come-to-terms-with-reality moment with MNDOT when they talk about using that bridge. tl;dr: I think Froggie's/mattaudio's Fort Snelling alignment shown above is pretty realistic and ideally the way you'd want to go. But if you can't put rail on that bridge...then what? That's where the second deck comes in - it would allow rail and recreational paths at grade to Ft. Snelling and West River Road. I think we've discussed the Fort Road Bridge Redeck somewhere else, but I can't find the posts. But yes, the existing bridge is awful. My car was totaled on that bridge when someone rear ended me. It's this short stretch where people want to go 55+, but there are major merge problems at each end. Especially eastbound. I have no idea why they don't merge eastbound 5 to one lane, allowing for the ramp from 55/62 to have its own lane. Edit: My guess is that the reason for the delay is St. Paul's master planning process for the area. I've seen OFFICIAL fetish maps that show a direct connection of the bridge to Shepard Road by way of the vacant Unisys/USBank Riverview site.